It’s been cold for the last couple of days here in Northern California. We had rain, wind and hail, it really got super crazy! 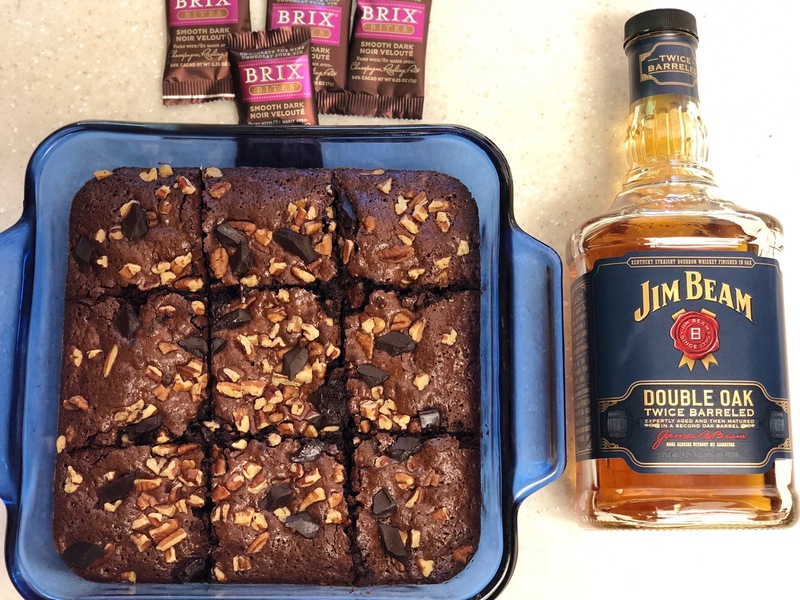 I was craving brownies so I decided to bake some and I added bourbon to it (hubby loves Bourbon and he thought it was a great idea!). Also, you know that I love love Brix which is chocolate for wine. Brix is always part of my party cheese trays and wine nights with my husband. Brix offers 4 types of chocolate: Milk Chocolate, Smooth Dark, Medium Dark and Extra Dark. 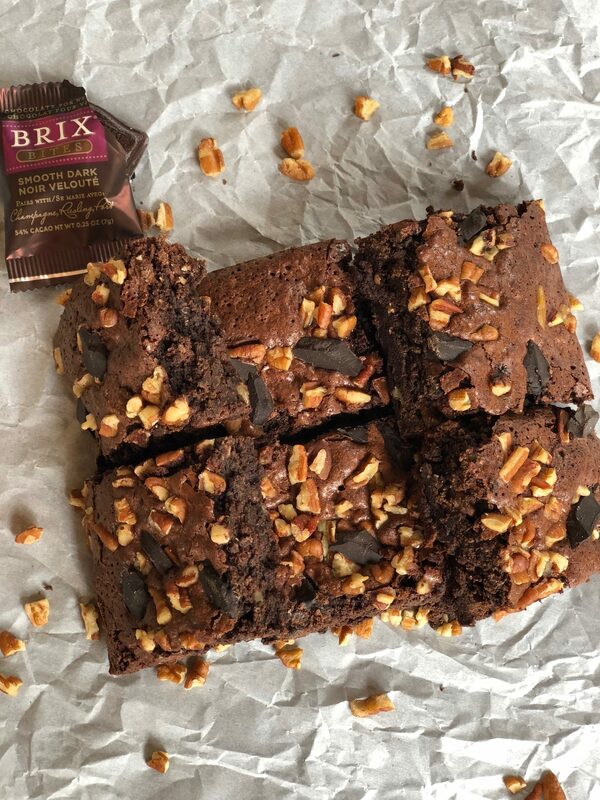 I like to use Brix chocolate for my baked goods too. 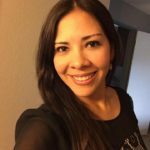 For this recipe, I used Smooth Dark Brix chocolate and the result was really good. You should try to make this! Grab a glass of wine or a cup of tea and enjoy. Believe me, you won’t regret it. 1.- Preheat oven to 350 degrees F. Line an 8 by 8 inch baking pan with parchment paper and lightly butter parchment. 2.- Sif together flour, cocoa, baking powder, espresso powder and salt. Set aside. 3.- Combine butter and chopped chocolate in a saucepan. Stir over low heat until the chocolate is almost melted. Remove from heat and continue to stir until smooth. Whisk in granulated sugar until incorporated, you will notice the batter being a little grainy, and that’s ok.
4.- Whisk in eggs, one at the time, until the batter is smooth and shiny. Add in the bourbon. 5.- Put dry ingredients over top of chocolate mixture and whisk until just incorporate (do this in a gentle way). Add the chocolate chips/chunks and 1/2 cup of pecans. 6.- Spread into prepared pan. Sprinkle with remaining pecans, chocolate chips/chunks . 7.-Bake for 30 minutes or until top is shiny and crackly. Please, insert a toothpick and see if it comes out mostly clean. Cool it completely before slicing into squares. I got 9 big squares. This entry was posted in Recipes and tagged baker, blog, brix chocolates, brownies, brownies recipe, chocolate, chocolate bourbon brownies, recipe.